Wish you had a checklist of necessary home maintenance tasks? We created one! 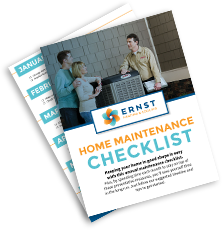 Download this handy list, print it off, and never worry about when to perform certain home maintenance tasks again. By completing everything on this list each year, your home will operate more efficiently, and you’ll be less likely to need emergency repairs on your HVAC and exterior home. Yes! Sign me up for monthly news and home improvement tips!